Welcome to Camelottaspots. We are a breeder of Bengals and Savannahs. Located at an elevation of 4500 feet, our ranch is nestled in the Cerbat Hills of Kingman, AZ. We are a USDA licensed facility and also hold a Game Farm permit from the State of Arizona. Visitors are always welcome, and we encourage people to pick out their kittens in person. All of our kittens are very well socialized from the time they are born. They are handled daily and learn to crave human attention. Our kittens are vaccinated and microchipped before they leave our home. Our Savannahs come with their very own walking jacket, as well as a copy of our book on how to raise and train a Savannah cat. 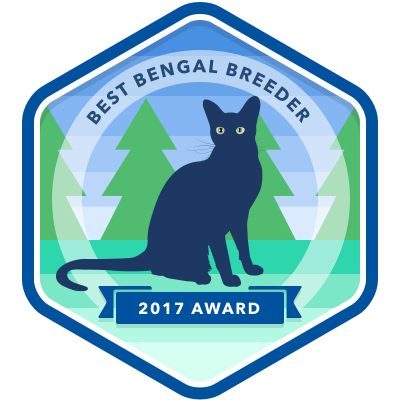 In addition, 100% of the proceeds from the sale of our purebred Bengal and Savannah kittens is donated to the Exotic Heritage Cat Association of America to support the cats in rescue at this 501(c)(3) no-kill, feline-only shelter. Please take some time and browse our website. If you see something you like, please don't hesitate to contact us. We are happy to answer any questions you may have. In an effort to assist our buyers with raising and training their Savannah kittens, I wrote this book, which is provided free of charge to those people who purchase a kitten from us. However, the book is also offered to others at a cost of $25 USD within the United States and $32 USD outside the United States. These prices INCLUDE shipping. If interested, please PayPal the appropriate funds, for where you live, to arden@camelottaspots.com. Proud Members of TICA since 1999. Member of Patrick Kelly's SavannahCat.com since the year 2000.